170 Beacon is located on the north side of Beacon, between Berkeley and Clarendon, with 168 Beacon to the east and 172 Beacon to the west. 170 Beacon was built ca. 1861, one of two contiguous houses (168-170 Beacon) built for John Gardiner Cushing and his younger brother, Robert Maynard Cushing. They were sons of John Perkins Cushing, a partner in the shipping merchant firm of Perkins & Company founded by John P. Cushing’s maternal uncle, Thomas Handasyde Perkins. John P. Cushing served as the firm’s agent in China for thirty years. After returning to Massachusetts, he built an estate, Bellmont, in a portion of Watertown which later became the town of Belmont, named after the estate. The land on which 168 and 170 Beacon were built was purchased by the Cushing brothers on October 7, 1861, from real estate dealer Henry Whitwell. John Cushing purchased the land for 170 Beacon, where he built his home, and Robert Cushing purchased the land for 168 Beacon, where he built his home. The land originally was part of two parcels purchased from the Boston and Roxbury Mill Corporation on June 7,1860, one by real estate dealer Henry Whitwell, and the other, immediately to the west, by shipping merchant and real estate investor George Lowell Gardner. On March 6, 1861, John Gardner sold the eastern part of his parcel to Henry Whitwell, who then sold the western two-thirds of his expanded lot to the Cushing brothers. John L. Gardner and his wife, Catharine Elizabeth (Peabody) Gardner lived at 7 Beacon, and would build a new home at 182 Beacon in the mid-1860s. Henry Whitwell was unmarried and lived at 79 Beacon with his parents, Samuel Whitwell and Sophia (Story) Whitwell; they moved to 161 Beacon in the mid-1860s. In the Appendix his Houses of Boston’s Back Bay, Bainbridge Bunting indicates that 168-170 Beacon were built for John Lowell Gardner and acquired by the Cushing brothers after they were completed. Based on the deeds, however, this is not correct. Click here for an index to the deeds for 170 Beacon. 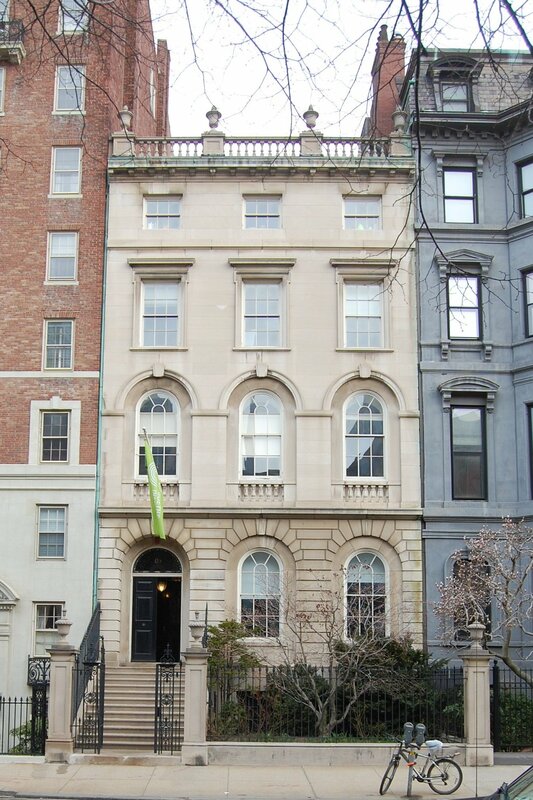 By 1865, John G. Cushing and his wife, Susan Prescott (Dexter) Cushing, had made 170 Beacon their Boston home. They previously had lived at the Cushing family home in Belmont, which they continued to maintain as a second home. They were joined at 170 Beacon by his brother, Thomas Forbes Cushing. He married in June of 1866 to Fanny Leslie Grinnell and they moved to a newly-built home at 190 Beacon. John Cushing died in December of 1881. Susan Cushing continued to live at 170 Beacon. During the 1886-1887 winter season, Susan Cushing was living elsewhere and 170 Beacon was the home of John Gardiner Cushing’s brother-in-law and sister, Edward Darley Boit, Jr., and Mary Louisa (Cushing) Boit. Edward Darley Boit was an attorney by training who gave up the law to become a painter. The Boits previously had lived in Paris. By the 1887-1888 season, they were living at 65 Mt. Vernon. Susan Cushing resumed living at 170 Beacon during the 1887-1888 winter season, and continued to live there until about 1890. During the 1890-1891 winter season, 170 Beacon was the home of Mrs. E. C. Jones. She had lived at 120 Beacon during the previous season. During the 1891-1892 winter season, 170 Beacon was the home of banker Herbert Mason Sears and his wife, Caroline (Bartlett) Sears. They had been married in June of 1891 and lived temporarily at 170 Beacon while their new home at 287 Commonwealth was being built. During the 1893-1894 winter season, 170 Beacon was the home of banker Thomas Jefferson Coolidge, Jr., and his wife, Clara (Amory) Coolidge. They had lived at 93 Beacon during the previous season, and at 408 Beacon during the 1891-1892 season. They had married in September of 1891. By the 1894-1895 season, they had moved to 184 Beacon. On March 2, 1894, the Cushing family sold 170 Beacon to Helen (Ellis) Brooke, the wife of Rev. Stopford Wentworth Brooke. They had married in June of 1893, and had lived briefly thereafter at 9 Exeter. A native of England, Stopford Brooke had come to Boston in 1886 and soon thereafter became pastor of First Church (Unitarian). They continued to live at 170 Beacon until 1898, when he resigned as pastor. In 1899, they moved temporarily to San Francisco, and then moved back to England, where he later served as a Member of Parliament. During the 1899-1900 winter season, 170 Beacon was the home of Amy Gore (Walker) Iasigi, the widow of Oscar Iasigi. Oscar Iasigi had been treasurer of the Vassalboro Woolen Mills and had served as Consul General for the Ottoman Empire in Boston; he was killed in the wreck of the steamer City of Columbus in January of 1884. During the 1897-1898 season, she had lived at 244 Beacon, after which she traveled abroad. By the 1900-1901 season, she was living at 151 Commonwealth. On May 28, 1900, 170 Beacon was purchased from Helen Brooke by Eben Howard Gay. He previously had lived at 169 Beacon, where his wife, Cornelia (Fanning) Gay, had died in November of 1900. Eben Gay was a banker and noted expert on antique furniture. He had 170 Beacon significantly remodeled by architect and interior designer Ogden Codman, Jr., including a new Adamesque front façade and interiors to provide a setting for Gay’s collection of Chippendale furniture. In about 1902, Eben Gay was joined briefly at 170 Beacon by his aunt, Miss Elizabeth R. Blood, who previously had lived at 187 Beacon with Eben Gay’s mother, Ellen (Blood) Gay, and brother, William Otis Gay. 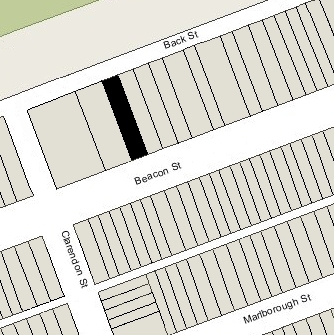 By 1903, Miss Blood had moved back to 187 Beacon (where William Otis Gay continued to live), and Eben Gay’s mother had joined him at 170 Beacon. They continued to live there together until about 1909, when he moved to 5 Mt. Vernon Place and she moved back to 187 Beacon. By 1911, Eben Gay had moved to an apartment at 186 Commonwealth and his mother was once again living with him. On March 30, 1909, Albert M. Lyon foreclosed on a mortgage given by Eben Gay, and transferred the property to Robert W. Kelso, the successful bidder for the property, and on April 22, 1909, the property was acquired from Robert Kelso by real estate dealer James Sumner Draper. On May 4, 1909, 170 Beacon was acquired from J. Sumner Draper by Mary Rosabel (French) Dennison, the wife of Charles Sumner Dennison. They previously had lived in Newtonville. They also maintained a home in West Falmouth. Charles Dennison was president and treasurer of his family’s firm, the Dennison Manufacturing Company, makers of boxes, tags, stationers’ supplies, and paper specialties. Charles Dennison died in August of 1912 and Mary Dennison moved soon thereafter. By 1918, she was living in Santa Barbara, California. She continued to own 170 Beacon until 1938, leasing it to others. During the 1912-1913 winter season, 170 Beacon was the home of Henry Hornblower, a stock and bond broker, and his wife, Hattie Frances (Wood) Hornblower. They previously had lived at 291 Commonwealth. By 1914, they were living in Arlington. During the 1913-1914 winter season, 170 Beacon was the home of Bayard Warren and his wife, Elizabeth (Sears) Warren. They had married in April of 1913, and 170 Beacon probably was their first home together. He had graduated from Harvard in 1913 and would later become a trustee of estates. 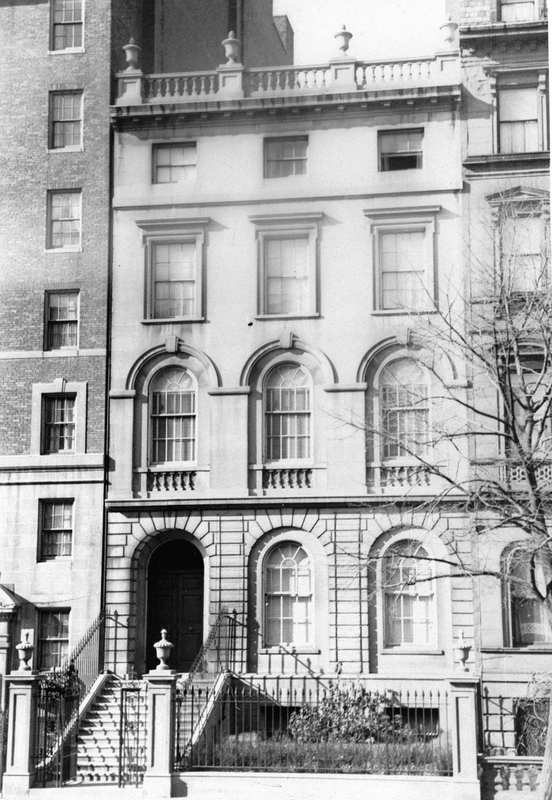 Prior to their marriage, Bayard Warren had lived at 261 Marlborough with his mother, Mabel (Bayard) Warren, the widow of Samuel Dennis Warren, Jr. Elizabeth (Sears) Warren was the daughter of Herbert Mason Sears and Caroline (Bartlett) Sears, who had lived at 170 Beacon during the 1891-1892 winter season. By 1915, Bayard and Elizabeth Warren had moved to Prides Crossing. By the 1914-1915 winter season, 170 Beacon was the home of attorney William Henry Coolidge and his wife, May (Humphreys) Coolidge. They previously had lived at 336 Beacon. They also maintained a home at Blynman Farm in Magnolia, which was their primary residence. They continued to live at 170 Beacon in 1918, but moved to the Hotel Somerset by the 1918-1919 season. By the 1918-1919 winter season,170 Beacon was the home of Abraham Koshland and his wife, Estelle (Wangenheim) Koshland. They had lived at 168 Bay State Road in 1918. They also maintained a home in Beverly. Abraham Koshland was a wholesale wool merchant from San Francisco in his family’s fim, J. Koshland & Co. The Koshlands continued to live at 170 Beacon in 1930. By 1931, J. Koshland & Company had closed its Boston offices, and Abraham and Estelle Koshland had moved to the Ritz-Carlton Hotel. By the 1930-1931 winter season, 170 Beacon was the home of attorney Bartlett Harwood and his wife, Mary Louise (Ramsdell) Spaulding Harwood. They previously had lived at 30 Chestnut. They also maintained a home, Hill House, in East Aurora, New York. They continued to live at 170 Beacon during the 1932-1933 winter season, but moved thereafter to 205 Commonwealth. On April 19, 1932, Mary Dennison transferred 170 Beacon to a trust with her husband’s nephew, Henry Sturgis Dennison, and attorney Reginald L. Robbins as trustees. 170 Beacon was not listed in the 1934-1937 Boston Blue Books, and was shown as vacant in the 1934-1940 City Directories. On March 23, 1938, 170 Beacon was purchased from Reginald Robbins and Henry S. Dennison, trustees for Mary Dennison, by Mary C. (Sweeney) Mahony, the wife of Thomas Harrison Mahony. They previously had lived in Waban. Thomas Mahony was a lawyer and peace activist. In the 1930s, he was a founder and Co-Chairman of the Massachusetts Committee for World Federation, and in 1945 he was instrumental in founding the United World Federalists. The Mahonys continued to live at 170 Beacon in 1949, but had moved to 61 Mt. Vernon by 1950. On August 1, 1949, 170 Beacon was purchased from Mary Mahony by Edward S. Ryan. In December of 1949. he filed for (and subsequently received) permission to convert the house into a three-family dwelling; in June of 1950 he amended the application to increase the number of apartments from three to five. Edward Ryan was an antiques dealer, representing a firm in New York, and lived in the unit on the basement level and first floor of the house. Complaints were filed in 1950 and 1954 that he was using the house as a furniture salesroom, but investigations by the Building Department found no improper use of the building. In September of 1966, he filed for (and subsequently received) permission to convert the house into a library with exhibition and meeting facilities, and a single dwelling unit, for use by the Goethe Institute. On November 28, 1966, 170 Beacon was purchased from Edward Ryan by the Federal Government of Germany. It completed the remodeling for use by the Institute. 170 Beacon remained the Boston headquarters of the Goethe Institute in 2015.